This interview took place on: 11/8/09. Jesus freak Hideout (John DiBiase): ...Church Music is definitely a different approach for you guys. A Collision had that bluegrass, country-ish feel at times. Remedy was a little more... "safe." David Crowder: It was a palette cleanser, yeah. I don't know how much you are following what we're doing, but we're [doing] like a seven "works" - I can't call them "albums" because the seventh one might be a little weird, but - modeled on the Creation story. Y'know how the second three days mimicked the first three days with "Let there be light?" Well then by day four, you've got the sun and the moon... it's a little crazy to think about. So Remedy was sort of the sibling or cousin, however you want to say it - it was related to Can You Hear Us?, and Church Music's related to Illuminate. Just in the overarching "we need some sort of structure outline to fit what we're doing into" and so it sort of gives us a big "meta-thing" we're working under. So yeah, Remedy was reminiscent of Can You Hear Us? and to me, Church Music and Illuminate are pretty similar in a lot of ways. So the next one, obviously, is A Collision's brother or sister or cousin. Whatever dubious relation you can come up with. JFH (John): Well, it's interesting, because when I popped in Church Music, I was really expecting kind of just another worship record or a hymns record or something. So what made you choose such a title for such a direction? David: Well, I'm kind of a nerd with language. I love language in the sense that it's fluid. Granted, if you're talking to linguists, you can argue for hours about what causes definition to occur, whether it's usage or strict defs, but I feel like usage creates the fluidity of language. The way we use words will shape what they mean in the future. So "church music" - these are just two little words that immediately create expectation in people. Like if you're coming from a more progressive setting, you would hear these words and know our music and go, "This is not quite like church music." Choir robes... organ... A little more reserve would be necessary. And if you're coming from a traditional setting, you would hear these words and hear our music and go, "Absolutely not! This is NOT church music! This is much too irreverent." And I think what's amazing about the two words is there's critique for all of us in it. That if we're thinking about art... if you think of the global church, here's this faith erupting from very different cultures and people and yet we tend to think of everybody like ourselves. That there's this expectation that others' expression would look like ours, and so there's this inability to appreciate what's coming from another group of people that are carrying the same story and verbalizing it in very different ways. And so, to me it's been fun. We've been sitting on the words for awhile, all knowing we'd come to it in the second cycle of things, because, another little inside deal... The syllables in the titles - the first round are four syllables and the second round are three syllables, which the first of the records are more, I think, human or materially. The content matter, what we're talking about, seems more earthly, and as we're moving forward, it's going to, I think, have a little bit more of a transcendent flair in the content. That was an aside. But "church music" - the words - I just liked that the words have a lot of power to shape expectation. And you couldn't have made this -- you know, being in Christian music -- we couldn't have put out a record like this ten years ago and called it Church Music. You wouldn't get the, I don't know, satire, irony of it... (John: Sarcasm.) Yeah. At this point, there's enough of that tongue-in-cheek thing available, which is encouraging, because I think that's what the church does really poorly. Y'know, when the rest of the world's communicating culturally in irony and satire, the church doesn't know how to do anything except talk literally. So I think it's a good sign that we could do a record like this and people kind of "get it." David: Yeah, that's very true. To use music that's known as one of the more self-indulgent eras in music, I like the juxtaposition of it. And it's the same with the lyric. So, you've got "church music" and it's juxtaposed with this selfish, cultural thing that we breathe - I mean individualism is just what we breathe in and out every day of our lives - yet what we're trying to build is community. Cuz again, all our stuff is coming from a local church setting, so our intention in building a church is to try to figure out how to foster community in some sense. And it's just [that] always you're bumping up against individualism. So, to take the most indulgent era of pop music that we've had in the recent past and put it with this thing that's supposed to tear away the individual and allow us to speak and be free to point at each other and say "Hey dude, let's call each other to something grander than what we're living currently," seemed to make sense. And as well, to try to hint that... If you strip the music from the lyrics, they're really pretty bleak in a sense. "Dance if you're wounded?" I mean, that's bizarre. Usually, you'd propose something joyous to dance on behalf of, rather than [that]. So all of that was just to point to the space that the church exists within culturally here in America and help call us to something bigger I guess is the attempt. JFH (John): So what were your stylistic inspirations for the whole record? David: Well, here's what we did: I think with each record we've approached the recording process differently. This time around, knowing we were going to call it Church Music, our conversation and what we'd been talking about - "If we're going to call it this, then what should it look like, what should it sound like, what should it be?" - and actually where it wound up was not where we thought it would be in the beginning. And we're usually working a record ahead, so we were working on this while working on Remedy, so we were headed out - this was like two Summers ago - on the Passion World Tour, and we thought, "Oh, this will be amazing! We'll get to go around the globe, be in all these different cultures, we'll check out what is the authentic expression of all these places different than the United States of America and see what their current progressive worship sounds like and looks like. Well, what it sounds like and looks like is that America has been incredibly adept at not only exporting goods and materials (*laughs*), but also our lastest worship hits. Cuz that's all they're playing is like American worship music. And I was so mad. I couldn't tell you how mad I was. I was like, "You gotta be kidding -- I mean, I'm glad you like our music, I'm glad you're singing it, but what are you guys writing? What's coming out of your experience?" And so we then re-shifted and thought, "Well, let's look at the cultures that these churches are existing within. If, say, on a theoretical level, the Crowder*Band lived in Tokyo in Japan, what would the music of this Crowder*Band sound like, look like, if we were to try to give an authentic expression or articulation of faith in Tokyo?" And so in each city, we collected a lot of pop music, so [while we were] there we just bought a bunch of J-Pop, and in Korea, got a bunch of K-Pop, so just went around collecting a bunch of the music, and started noticing that, especially once we were in Europe, that so many of the producers that are doing big pop hits now... Well, I should back up - One, noticing that pop has moved in a much more urban direction than when we started ten years ago. Ten years ago, the modern worship movement, I think, was really just an embrace of pop music at the time. The church threw its arms back around something that was common among us. Pop music, y'know, we were influenced [by] whether we were shopping at JC Penny or on the Internet. Doesn't matter, you're bombarded. And it shapes your sensibilities and what moves you as a human. And at the time was the praise chorus, which was a very innovative moment for the church. When the praise chorus was able to expand, what it expanded into was basically Britpop, mostly U2-oriented music. If we could pull off U2, if you could get your guitarist with his dotted eighth note on the delay pedal, in love with The Edge and these big grand arena melodies, then we were golden. And so it let the praise chorus grow into something a little more provocative, I guess. So that was ten years ago when this thing happens, and it seems like the same model keeps getting regurgitated over and over and meanwhile, it's either urban-based stuff that's selling, or I mean, even Katy Perry - it's all urban-based, the production end, the track that the stuff is sitting on top of. It's either that or Taylor Swift. *laughs* It's either Lil Wayne or Taylor Swift that's selling. So it seemed to us that means we need to start with track. Because we feel like when the church has been most effective, and with church music when there's been this moment of creative explosion where art has all of a sudden blossomed, it's been when the church has thrown its arms around whatever was common among us. As music lovers, it can be really easy to hate on pop music, because it is pretty much the lowest common denominator of things, but as a hymn-writer or a writer of congregational songs, what you're trying to do is put your finger on the pulse of what's common. So it seems like that's where we needed to look first, is towards pop music. And pop music was track-related and track-based, so we started with track. JFH (John): So when it came time to write these songs, did you feel like it was natural -- like do you really like the songs that you wrote, or...? David: Oh, well, that's always necessary, obviously. We're pretty good at the editorial side of things, I think, if something ain't happenin'... And I love pop music, I should say that to begin with, so naturally, I think what we as a band, our tastes are really broad. It's from Waylon Jennings to Lil Wayne. I'll give him some cred. *laughs* - and to have that broadness. And all the indie rock stuff, y'know. We're on a college campus, so college radio... Grizzly Bear is about the best thing that has happened in years. So, you've got all of that that we have among us as a community, and we're trying to stick it all in one spot so that it feels like, again, an authentic response to who God is and what He's done. So in a sense, we're creating just from what's inside of us, but it also seems we view what we're doing in a utilitarian kind of way. What we do is useful to the extent that it provides an ability for our community to voice things back to God. If it's unsuccessful in that, then it's just self-indulgence. So that's where our attempt has been. JFH (John): The thing I like about the record is it's a lot more textured and daring and "risky" then a lot of worship music can be. It seems a lot of worship music is stuck in a safe plane. The core of it sounds the same, like you said, kind of a U2 sort of mimic or whatever. Do you feel like overall a lot of worship music is like that? David: Well, I don't listen to a lot of worship music, to be honest. Well, that's slightly disingenuous. Well, no, I can say that. I don't listen to a lot of worship music, but I pay attention to the songs that get really big. Cuz we want to have a local expression sure, which is what our purpose is is to articulate our unique experience, but I also want to connect our church to the broader church. Like if there's something happening in the American church that fits, I want to pull it in so that we're connected to the whole in a sense as well the same globally. Like we're trying to find what's an expression that's happening [globally]. A good example would be "Mighty To Save." This is a song that is really ubiquitous. We'd be on the other side of the planet - well, granted, it came from the other side of the planet, but - We'd be here in America and on the other side of the planet, here's this song that just takes over. We'd go into all these different spots on this tour and that would just be this big moment. Well, we would do it in our church to try to connect everybody, and it's just a flop at our church. Because the people that are there have a lot of issues with church language. There's a lot of baggage that they come with that we're trying to help them set down. So we would force feed a thing like "Mighty To Save," to help them see and get a picture of what's happening elsewhere, so I'm saying it's disingenuous in the sense that I haven't listened to a lot of it, but I try to find things that I can insert into our experience that will help connect us to the bigger thing. But I don't think what you're hearing - the sort of redundancy of it - isn't necessarily bad. It's like why we get stuck. It's like why the hymns stayed around for long. Because what it becomes is this way that we as the church respond to God. And then so our expectation of how we approach God and how a response to God looks like and how we posture ourselves, it becomes a model we come back to again and again, because we want that same experience, the same thing. But what you'll have is, eventually, people that come along and [find that] there's some staleness in some places and there are people that are getting sort of frustrated by the staleness. So how can we keep going forward, y'know? How can we keep throwing our arms around what's happening currently and I think you have to be in a unique environment to be able to do that. Because, again, all these people that you're hearing the records come from, are in communities of folks that if they were doing anything like what we're doing would be useless. Like, you're not giving that authentic expression to your congregation. JFH (John): Right, that "style" is still reaching people. We're more of the minority. David: Yes. So you see moments like this where we feel like, "Oh man, there's something ahead of us," and I think you need people pointing ahead, but not at the sake of communities that are really thriving and don't need anything other than what we've got currently. JFH (John): Do you think the church is embracing the new record? David: Well, I should say that the people who've attached to the music seem to like it for the most part... unless you just don't like any electronic-oriented stuff. Which, to me, means you don't listen to stuff that's [current]. Another thing we watch is commercial music. Not just like, "cool, we're going to grab the indie song and stick it on [our record] to legitimize our company," but like bumper music in and out of football or in and out of news casts and stuff. Like these people aren't at the edge of things, but they're very conscious of it. They're using sound and music in a way that shapes psychologically how the experience of the viewer is. And, to me, the church is not where culture is. Because all of the music that you hear, is not what you hear in worship music - where, rewind ten years ago, I think we were. I think it was where it was, but in a decade already, we're sort of behind because we found something that worked. It felt new and fresh. (John: It's comfortable now too.) Yes. But I think if we continue in the conversation of how do we continue to tell the story of God in a compelling way to people outside of the church, our art will continue to have to follow the trends of where we are as a larger culture, not just where we are as a church culture. JFH (John): Do you have a favorite or most meaningful song on the new record (Church Music)? David: Um, hmmm... Y'know, I think the "Eastern Hymn" is probably one that I am most attached to. It seems like it gets to say the most and it has a bridge that has a lot that it proposes in the middle of it, just due to the political climate, even the stuff that we've been talking about. Just that there's a lot within the church that is difficult to talk about and the conversations can get heated and passionate very quickly. JFH (John): Why the song title "Birmingham?" JFH (John): Really? Why is it a secret? JFH (John): That's super cool. So, "What A Miracle" was originally a rap about Atlanta? David: How do you know this?! David: Oh, really?! Oh, no! That's hilarious! I think Hogan must have written that. Well, actually we wrote it, I must not have read that. That's hilarious! Here's what's funny -- it was about Atlanta, but we were in Dallas. *laughs* We were in the old Reunion Arena where the Mavericks play so we were down in the Mavericks' locker room, and we were imagining pregame. And I had just had this track going, and before I knew it, Mark and them had proposed this whole rap about the ATL: guns and drugs, everything. It was all there. JFH (John): *laughs* Probably wouldn't have fit on the record. JFH (John): That's awesome. Can you talk about the song, "Can I Lie Here" - its imagery and even how you recorded it? Because the drum sound is awesome. David: Oh man, yeah, that was a fun one to track. It was a Logic File at first. It was just these big huge drum reverb things, y'know? Not listenable, but just the idea was there. And so to go after it, we wound up in my garage, which was quite lively. The sound seemed to last forever in there. So that was a fun one. Just the production side of things was a blast. But the content - one of the problems we run into writing congregational songs, especially now, a lot of times in the charismatic movement it seems like romantic language is one of these contentious things among us, whether it's appropriate or inappropriate. So we could talk for a long bit about that. It's sort of a pun of a song. What we're really saying is, "Is it possible to be inauthentic in our worship?" And I don't think it's possible. In the sense that God knows the heart, then all the posturing and the stuff we bring into a moment of corporate worship is pretty useless when it's the heart that's what's visible. So, to be in the presence of God, is impossible to be dishonest. And that's what the song's really saying. "Can I lie here in Your arms?" It's "No, I can't." David: Correct. Rather than the romantic side. But we knew that everyone would have this nice fuzzy, soft feeling about it. JFH (John): Now there's a really cool story about how you met Lacey from Flyleaf, right? JFH (John): Can you talk about that and what lead you to want to cover "All Around Me?" JFH (John): And isn't there also like thunder in the background? David: Yes, it does sound like thunder, but that is actually people -- y'know the crowd that's in the front intro section of "How He Loves?" That's the crowd noise from that song, but we just jacked with it so it sounds like thunder. David: Yeah! I do too. It's one of my favorite sections of the record. That into "How He Loves." You finally get some of the intimacy... That would be one of my criticisms of the record is [I wish] we had a few more moments that were stripped away and there was an intimacy present. I think that there could have been a couple of sections where we did that, but it would have been too difficult. JFH (John): Well, you could always do an acoustic EP. JFH (John): But I think it makes those two songs more powerful. David: Stand out. That is easily arguable. JFH (John): And I haven't heard too many versions of "How He Loves" that I really liked, and that one is honestly my favorite version that I've heard. I really like the vibe that you give it. Especially paired with "All Around Me." David: I do agree. I like it. It's a good moment on the record. JFH (John): Now, you sing a lot about joy. Do you ever have those days when you feel like you have to fight for joy. David: Y'know, the bizarre thing is, I feel like most of the vocalizations of joy are statements of hope. I think I'm a pretty bleak person. David: Yeah. *laughs* My outlook is pretty bleak. I'm pretty cynical. And I'll see expressions of even just childlike joy and that's a desire. So I feel like a lot of that's a hopefulness in the writing. JFH (John): So in the process of singing about it, you are fighting for it. David: Yeah. It's sort of the idea of the black spirituals, y'know? They would sing about this place they wanted to be. And they'd almost sing themselves into it - is sort of how I look at that. JFH (John): Interesting. Do you feel like, when you're singing some of these songs, that you do get there? David: Uh... on occasion, yeah. JFH (John): That's interesting. Cuz with a song like "You Are My Joy," I'll listen to it and sing along, but wonder if I really know what it's like to be able to claim "You are my joy?" David: Well, here's where that song comes out of... we were in an airport and we're riding on one of those people-mover-things (moving walkway) and we're just standing there and it's been one of those days, y'know? Just not been cool. And we looked out the window and see the plane we're getting on and watched all of our cases drop from, whatever it is, ten feet from the little cargo door to the ground *laughs* I'm like, "Are you kidding me?! You've gotta be kidding me. Insult to injury!" And this statement sort of came up in me, out of a pretty lame spot - not the cases being dropped, but the day culminating in that moment, just felt like (John: ...the icing on the cake...) Yeah. I dunno. This thing came out, like "Huh... Maybe I could sing myself to somewhere better." JFH (John): What do you feel God has been teaching you lately? David: How to confront each other properly. How to be confrontational in ways that are generous. That would be it. How to speak truth in a way that is productive rather than destructive. Most of the time I'm not good at it, but I'm trying. JFH (John): Now, to get really serious..... What are some of your favorite old school NES games? David: Oh, wow, dude! You're doin' it! ... Well, all the typicals. I mean, Mario Bros. is kinda "it." And Duck Hunt. JFH (John): I never would have guessed by the sound effects you use in your show -- and it's awesome, by the way, that you worked it into the record. JFH (John): There's nothing wrong with it! David: Well, anytime we would hear any of the bleeps and blips, we just had this grin and "Ah, dude, I love this!" And finally we pinpointed, "Well, I think we spent too many days in front of the TV at friends' houses trying to save the Princess." It affected us. 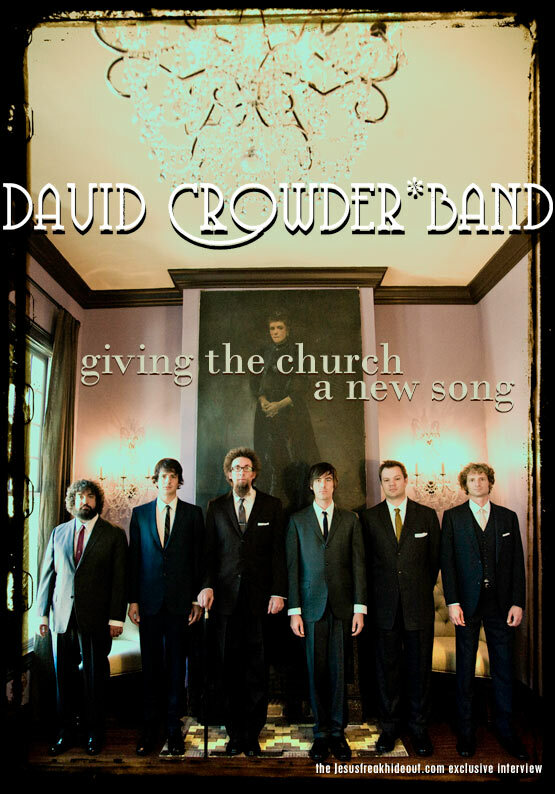 David Crowder*Band's new album, Church Music, is available NOW wherever music is sold.